These learning questions (LO1 through LO6) are cross-referenced in the textbook to individual exercises and problems. ÂŠ 2012 John Wiley and Sons Canada, Ltd. Analysis of a scatter plot provides general information about whether a cost appears to be variable, fixed, or mixed. If there is a linear pattern in the scatter plot and the trend appears to go to zero, the cost could be variable. If a scatter plot with a linear trend intersects the vertical axis at a nonzero value, it could be mixed. If the pattern is linear with little or no slope, the cost could be fixed. Cost Management because they better reflect the past fluctuations and therefore should better estimate future fluctuations. © 2012 John Wiley and Sons Canada, Ltd. Cost Object, Cost Function Estimation, Opportunity Cost A. Production of a high-definition flat screen monitor. B. If all of the parts for the monitor are currently used in the organization, all of the information is likely to be contained in the accounting records. But new parts are most likely needed, since the monitor is a high-definition flat screen and probably involves different technology. Thus, estimates of costs from suppliers will be needed. In addition, estimates for the amount of labour time will be needed. Although labour cost per hour can be found in the records, the amount of labour time is likely to be different for this monitor than for other monitors. If machines are used in production, an estimation of machine hours is necessary to determine whether maintenance and repair costs will increase. C. Estimating the cost of parts and the time involved in production is part of the engineered estimate of cost method. D. The opportunity cost of using idle capacity for one product is the contribution of other uses of the capacity. If another product could be manufactured and sold, that productâ&#x20AC;&#x2122;s contribution margin is the opportunity cost. If the capacity can be rented or leased out, the rent or lease payments are the opportunity cost. If there are no other uses for the capacity, the opportunity cost is zero. Explanation for Parts D and E: Notice that the wages of the tax department administrative assistant are considered a direct cost when the cost object is the entire tax department but are considered indirect for the other two cost objects. The benefits of tracking the cost at that level do not exceed the benefits of the information that would be obtained. For the firm to make this cost direct for the personal returns cost object, the administrative assistant would have to maintain detailed time records as to time spent working on personal returns versus corporate returns. Now notice that the tax partner's salary is considered a direct cost for all three cost objects. CAs do keep detailed time records. In a service business such as this, the CA's time is the product being sold. The time records that the tax partner maintains support this cost as a direct cost. Of course, the tax partner probably spends some time in non-billable activities, so a portion of his or her salary is direct only to the tax department and indirect to the two other cost objects. If she plans to drive 50 km, then she should choose Plan 2. If she plans to drive more than 99 km, then she should choose Plan 1. B. Arguments can be made for either treatment:  Including the cost of a temp worker as part of overhead would increase the accuracy of the cost function for direct labour cost. Illnesses cannot be predicted, so the number of absences (temp workers) cannot be predicted.  If this cost is added to overhead, the total employee cost will always be underestimated by the amount paid to the temp workers, which could be a problem. This method would reduce the amount of bookkeeping because hours do not have to be tracked to individual batches or units.  No matter how it is recorded, the cost of temp labour will be treated as product costs in inventory and cost of goods sold. Supplies: Monthly average cost per service call = $5.22, 5.25, $5.25, and $5.20. This cost appears to be variable. The average cost for the four months was $5.23. Electricity: Varies with weather, so May’s bill may best reflect costs in June Property tax: Should be assigned monthly. The total cost is $1,200 for 12 months, or $100 per month. Repair manuals: This is a fixed cost that varies slightly from month to month. The best estimate is the average cost over the four months, or $90 per month. © 2012 John Wiley and Sons Canada, Ltd.
C. Average overhead cost = ($3,819+$3,939+$4,730+$4,252)/(90+110+140+125) = $36.00 Estimated cost for 135 units = $36.00135 = $4,860.00 Note: This estimate is likely to overestimate cost because fixed costs in prior periods are spread over fewer units, on average. D. Developing a cost function with fixed and variable costs is more accurate than using average costs. An average cost would only be accurate if the value of the numerator used to determine the average was the same number used in future predictions. If volume is greater than this amount, the cost estimate will be too high; and if the volume is less than this amount, the estimate will be too low. Use one data point in the total cost function and solve for F: Using the data for 10,000 units: $450,000 = F + $39*10,000 F = $450,000 - $390,000 = $60,000 Combining the fixed and variable costs to create the cost function: TC = $60,000 + $39*Q Estimated total cost at 15,000 units: © 2012 John Wiley and Sons Canada, Ltd.
Learning Curve, Graphing - Tax Plus A. Hours for two returns would be determined as follows; using the learning curve equation Y = Xr Learning rate = 80%  = 6 hours X (units produced) = 2 Learning rate = (ln 0.80/ln2) = Y = 6 hours*2-0.3219 Y = 4.8 hours (average time for each of the next two returns) B. Cost Management As the accounting graduates become more familiar with the tasks involved in preparing simple tax returns, their productivity increases. However, as their performance improves, it improves less quickly for the next return. Eventually their learning will plateau, and their productivity rate will remain stable. Cost Function and Assumptions - Bison Sandwiches A. If total variable costs were $8,000 on total sales of $32,000, then variable cost per dollar of revenue is calculated as follows: $8,000/$32,000 = 0.25, or 25% of sales Combining fixed and variable costs, the cost function is: TC = $20,000 + 25%*Total sales B. Assumptions: Fixed costs remain fixed in total within the relevant range, and variable costs/unitremain constant within the relevant range. In addition, this particular cost function assumes that variable costs are driven by sales. Chapter 3 will point out another assumption for this cost function: the sales mix (the proportion of sales of different products) remains constant within the relevant range. Direct and Indirect Costs; Fixed, Variable, and Mixed Costs - Glazed Over [Note about problem complexity: Items F and H are coded as â&#x20AC;&#x153;Extendâ&#x20AC;? because judgment is needed for categorization.] A. D or I, F Assuming that employee time can be traced to each bowl, wages are a direct cost. However, if time is not traced to individual bowls (for example, if the employee performs different types of tasks and records are not kept of the types of work performed) or if the employee does not work directly in production, then wages would be an indirect cost. Wages are fixed because they remain constant (the employee always works 40 hours). B. D, V Assuming that the cost of clay can be traced to each bowl, it is a direct cost. Total clay cost will vary with the number of bowls made. C. I, F Depreciation on the kilns is indirect because it cannot be directly traced to individual bowls, that is, it is a common cost of production for all of the bowls that are heat-treated in the kiln. The cost probably does not depend on production volume (assuming depreciation is not based on units produced), making it a fixed cost. Note: Depreciation using a method such as declining balance is not constant over time, but would still be considered fixed because it does not vary with production volume. D. D or I, V If the glaze is expensive and therefore a relatively large cost, it is most likely traced to individual bowls, making it a direct and variable cost. If the cost of glaze is very small, it might not be traced to individual bowls, making it an indirect cost. Also, if the cost is small it might be grouped with overhead costs (variable). E. I, V or F Brushes for the glaze are most likely used for multiple bowls, making them a common cost for multiple units and an indirect cost. They might be fixed or variable, depending on whether they are “used up” after a certain quantity of production. F. I, F or M Electricity is an indirect cost because it cannot be traced to individual bowls. It might be fixed or mixed, depending on what causes the cost to vary. If the kiln is electric, part of the cost might vary proportionately with volume. G. I, F The business license is not related to production, making it an indirect cost. It is mostly likely a flat fee or is calculated on a basis unrelated to production volume, making it a fixed cost. H. I, F Advertising is not directly related to production, making it an indirect cost. This cost is also discretionary, so it is treated as fixed. I. I, F or M Pottery studio maintenance is an indirect and fixed cost if it is the same payment every week. If it is an hourly charge, it is probably a mixed cost, because the production area may need more cleaning as volumes increase. J. D or I, V Assuming that the cost of packing materials is traced to each bowl, this is a direct cost. If the packing materials are not traced (for example, if the cost is too small to justify tracing them), then this cost could be indirect. Packing costs are most likely variable because they will increase as production increases. B. In many organizations, costs vary with dollars of revenue. In this type of situation, total revenue (TR) instead of quantity (Q) can be used in the cost function: Total variable cost/Total revenue = $4,500/$9,000 = 0.50, or 50% of revenue Combining fixed and variable costs, the cost function is: TC = $3,300 + 50%*Total revenue © 2012 John Wiley and Sons Canada, Ltd. Cost Management C. The opportunity cost is the lost contribution margin from the products sold with the flavor that has been replaced. D. The cost of rent is irrelevant because it will not change with either alternative. advertising costs because the customers are most likely canneries and distributors with whom the fishermen have an ongoing relationship. Because advertising costs tend to be discretionary, they are treated as fixed costs. G. B; F or M Any type of business will have insurance costs. The cost might be fixed or mixed, depending on how the insurance cost is calculated. It will be a fixed cost if it is a flat amount, but it might be mixed if a portion of the cost relates to levels of business activity. A. Each cost function is written using the regression intercept term as the fixed cost and the slope as the variable cost: 1. TC = $55,000 + $21.00  assembly hours 2. TC = $20,000 + $31.00 labour hours 3. TC = $38.00  machine hours (Note: Because the p-value for the t-statistic is 0.25, the intercept is not statistically different from zero. Therefore, the fixed cost is assumed to be zero.) B. Assembly hours explain about 31% of the variation in overhead. The remaining 69% is unexplained. C. The p-value for the intercept in the regression of overhead cost against machine hours is 0.25. This means that there is a 25% probability that the intercept (fixed cost) is zero instead of $10,000. If this cost is used in a cost function, it will be zero one out of four times, which means that it is not a very accurate reflection of the expected cost. D. The p-value of the slope in the labourhours regression is 0.01, which means that there is a 1% probability that the variable cost for overhead related to labour hours could be zero instead of $31.00 per labour hour. E. The highest adjusted R-Square is 70% for machine hours. The intercept coefficient has a high p-value, so if we assume there is a fixed cost portion in total cost, we have a 25% chance of being wrong. Therefore, we ignore the fixed cost and assume that the overhead cost is strictly variable. Because the adjusted R-Square is higher than the other two models, machine hours is the best cost driver. F. Managers cannot know future costs. Nevertheless, they need to estimate these costs to make decisions. A cost function helps managers estimate future costs; it can also be updated to incorporate current estimates of future costs so that predictions are as precise as possible. Using a model such as the cost function also helps managers be more methodical in their approach to cost estimation, improving the quality of cost estimates. Higher quality estimation methods provide higher quality information for decision making. Following are calculations for the cost per unit of each ingredient and the cost of plain and cheeseburgers: Cheeseburger Cost per Unit Plain With Everything 1. Hamburger patty ($1.69/7) $0.2414 $0.2414 $0.2414 2. Hamburger bun ($1.29/12) 0.1075 0.1075 0.1075 3. Dill pickles [($8.95/2,000) * 4] 0.0179 0.0179 4. Tomato ($.69/8) 0.0863 0.0863 5. Lettuce ($.59/40) 0.0148 0.0148 6. Mayonnaise [$1.49/(16 x 4)] 0.0233 0.0233 7. Mustard ($.79/150) 0.0053 0.0053 8. Catsup ($.99/50) 0.0198 0.0198 9. Cheese ($2.59/16) 0.1619 0.1619 10. Onions ($.15/45) 0.0033 0.0033 $0.3489 $0.6815 A. Cost of plain burger = $0.3489 (calculated above) B. Cost of burger with everything except cheese = ($0.6815 - $0.1619) = $0.5196 Suggested selling price: 300% * $0.5196 = $1.56 C. Selling price of cheeseburger with everything: 300% * $0.6815 = $2.04 Therefore, the price of the plain hamburger should be: $2.04 - $0.25 = $1.79 Some students will view this higher price as "unfair." However, there is no moral obligation to maintain a 300% markup on each item. It is just a general guideline. Market forces will dictate achievable prices. D. In the current business environment, most organizations are price takers, that is, they set prices considering their competitors’ prices. If Ms. Long’s prices are too high, volumes will drop because customers will go to other fast food restaurants that sell hamburgers. Alternatively, if her prices are too low, she foregoes profits and people may believe there could be quality problems with her food. Therefore, she needs to know what competitors charge for a similar quality sandwich and price hers competitively. This means that her costs need to be below the competitive price. Alternatively, if Ms. Long is able to differentiate her hamburgers from others in the market, then she may be able to charge a price that is higher than competitors—as long as customers are willing to pay the higher price. 2.40 Cost Function Using Regression, Other Potential Cost Drivers A. TC = $222.35*units sold. (Notice that the T-statistics on the fixed costs indicate that it is not likely to be different from zero. Therefore, the fixed cost is set at zero.) B. The adjusted R-Square indicates how much of the variation in the marketing department cost can be explained by variation in units sold. In this problem, the variation in units sold explains about 61% of the variation in marketing department cost. Cost Management C. Other possible cost drivers for marketing department costs could be revenue, number of advertisements placed, or profits. In addition, it is possible that marketing costs are discretionary. The cost analyst needs to gather information about how marketing costs are set each year. For example, the analyst could ask the CFO whether the marketing department budgets its costs through a negotiation process with top management. If this is the case, the cost is discretionary and will be set through the negotiating process. Scatter Plot, Cost Function Using Regression, Three Potential Cost Drivers Central Industries The data for this problem can be found on the datasets file for chapter 2, available on both the Instructor and Student web sites for the textbook (available at www.wiley.com/canada/eldenburg). A spreadsheet showing the solutions for this problem is available on the Instructorâ&#x20AC;&#x2122;s web site for the textbook (available at www.wiley.com/canada/eldenburg). A. B. In a scatter plot, a good cost driver would presenta linear or football-shaped positive slope or trend. If the observations are widely scattered, the cost driver does not explain the variation in cost and either it is the wrong driver, or the cost is mostly fixed. In Part A, all three potential cost drivers appear to be positively related to maintenance costs. However, machine setups appears to be the most likely cost driver and direct labour appears to be the least likely cost driver. Sometimes a cost that is mostly variable can be identified from a scatter plot. For example, the trend line for machine setups looks as if the intercept could be zero or very close to zero. This indicates that the cost could be totally variable. The machine setups intercept coefficient is not significant, so it is excluded from the cost function. The regression using machine setups has the highest adjusted R-Square of 0.945. This means that variation in setups explains about 95% of the variation in cost. D. In the machine setups regression, the t-statistic is significant for the independent variable but not for the intercept. This provides confidence that the variable cost part of the cost function is not zero, but does not provide confidence that the intercept (fixed cost) part of the cost function is different from zero. Therefore, the cost is likely to be totally variable. The cost function is in C above. E. The use of past cost data to predict the future assumes that future resource costs and volumes of activities will remain the same as in the past. Changes in many factors such as resource prices, business processes, the economic environment, and technology can cause future costs to be different than estimated. Cost Function Using High-Low and Regression, Quality of Cost Estimates - Big Jack Burgers A. Total revenue (TR) instead of quantity (Q) in the cost function because sales is a potential cost driver. Under the high-low method, the cost function is calculated using the highest and lowest values of the cost driver. First, the variable cost is calculated: ($68,333 – $43,333)/($1,132,100 – $632,100) = $25,000/$500,000 = 0.05, or 5% of sales The fixed cost is determined by substituting the variable cost into one of the high-low data points: $68,333 = F + 5%*$1,132,100 F = $68,333 - $56,605 = $11,728 Thus, the total cost function is: TC = $11,728 + 5%*Sales B. The high low method uses the most extreme cost driver values, which could be outliers, that is, not represent the cost most of the time. That means that the cost function might not represent the actual cost, on average. Therefore, this cost function might provide poor estimates of future costs. E. Because of unforeseen changes in cost behavior, a cost function may not provide a good estimate for the next monthâ&#x20AC;&#x2122;s costs. The past costs used for estimation might not be representative, especially because so few observations were used in the estimation. Sales might not be the activity that drives administrative costs. There might be a change in business operations or in the economy that would cause future costs to be different than in the past. There might be a large discretionary component in administrative costs, causing fluctuations in cost that are unrelated to any cost driver. F. There is a positive or upward sloping trend line indicating that sales is an economically plausible cost driver for administrative costs. linearity. In addition, research and development cost is often discretionary. These costs are set by decision, usually annually. Managers set the costs depending on the organization’s strategies and funds available for research and development. Better cost estimates for discretionary costs can be obtained by gathering information about planned expenditures from the department head or from the managers who are responsible for costs. of the work is done by hand, then the chart suggests that the learning rate estimate is reasonable. However, if managers believe that more than 25% of the work is done by hand, then this chart suggests that the learning curve will be slower than the 90% estimate. D. The observations of labour costs over the first few weeks would not be representative of the labour costs once productivity has stabilized; they would be higher than the labour costs in later periods. If these values are used in a regression to estimate a cost function, then the cost would be overestimated. Total revenue is the most likely cost driver for both variable costs. Food costs are likely to vary proportionately with sales, and the University surcharge is specifically based on sales. C. Because revenue is the cost driver for both variable costs, total revenue (TR) instead of quantity (Q) can be used in the cost function: Variable cost = $28,000/$70,000 = 0.40, or 40% of revenue Combining fixed and variable costs, the cost function is: TC = $47,000 + 40%*Total revenue D.
TC = $47,000 + 40%*80,000 = $79,000 Profit = Revenues â&#x20AC;&#x201C; Total costs = $80,000 - $79,000 = $1,000 E. Lairâ&#x20AC;&#x2122;s fixed costs are assumed to be unchanged with the $10,000 increase in revenues. Only total variable costs are expected to increase, and the increase is estimated to be 40% of the increase in revenues. So, total variable costs are expected to increase by $4,000 ($10,000*40%). So, the additional profit from a $10,000 increase in revenues is expected ÂŠ 2012 John Wiley and Sons Canada, Ltd.
is more money available to spend on administrative travel, special promotions, employee training, and new office furniture or equipment. Although these expenditures are made because more money is available, they are discretionary expenditures and not caused by the level of activity. A correlation may appear ina scatter plot or regression analysis. However, correlation does not necessarily mean causation. Firm B's calculation for its selling price is as follows: Y = $300*300-0.2345 Y= $78.75 (average cost for each of the 300 units) Note that the cumulative production for Firm B through this year is 300 units. Total cumulative production cost (300 x $78.75) Total costs to produce the first 150 (from last year’s income statement) Total costs of this year’s production (150 units) Average cost per unit = $9,727.50/150 units = $64.85 Thus Firm B's selling price this year was $64.85 x 1.50 = $97.28 Firm B's income statement for this year is Sales (150 x $97.28) Costs (150 x $64.85) Income © 2012 John Wiley and Sons Canada, Ltd.
B. Sales seems to be a potential cost driver because there appears to be a positive correlation between the marketing department costs and sales. There is a positive slope, and most of the observations appear to have a fairly linear trend. Based on the regression results, the cost function is: TC = £65,584 + 1.34%*Sales D. If the variable portion of the marketing cost is sales commissions, it is economically plausible for sales to be a cost driver. E. Even if marketing department costs are discretionary, they may be positively correlated with sales. When more money is spent on marketing, sales may go up. In addition, discretionary costs such as marketing are often increased when profits increase. Assuming that profits are more likely to increase when sales increase, there would be a positive correlation between marketing department costs and sales. F. Discretionary costs are set by decision, usually annually. Therefore, the cost estimate should not be based on past costs, using regression or any other technique. Instead, the decision maker(s) should be asked what next year’s cost will be. Cost Function Using Regression, Scatter Plots, Three Potential Cost Drivers - Peer Jets International The data for this problem can be found on the datasets file for chapter 2, available on both the Instructor and Student web sites for the textbook (available at www.wiley.com/canada/eldenburg). A spreadsheet showing the solutions for this problem is available on the Instructorâ&#x20AC;&#x2122;s web site for the textbook (available at www.wiley.com/canada/eldenburg). A. Based on the simple regression results, machine hours appears to do the best job of explaining manufacturing overhead costs; however, this driver explains only 35% of the variation in cost. F. Yes, the direct labour hours was not significantly related to manufacturing overhead costs using simple regression. B. Labour hours does not appear to be a cost driver when using either simple regression or multiple regression; its coefficient is not significantly different from zero in either regression. Also, its coefficient is negative rather than positive in the multiple regression. Thus, labour hours can be eliminated as a potential cost driver. Both machine hours and raw materials are positive and significantly different from zero when using simple regression and also when using multiple regression. The adjusted RSquare is far higher in the multiple regression (0.806) than in either of the simple regressions (0.352 and 0.226) for these two cost drivers. A combination of cost drivers does a much better job of explaining the variation in manufacturing overhead costs than either cost driver alone. The cost function is: TC = $60,678 + $48.74*Machine hours + $82.93*Raw materials D. Manufacturing can be a complex activity requiring a number of different tasks. Each task includes different activities. Costs for these activities are likely related to specific cost drivers. In this example, machine hours and raw materials explain different activity costs, such as machining work on units, and materials handling for the units. A better understanding of the manufacturing process improves the ability to determine the types and number of cost drivers that can be used in a more complete cost function. Use of Prior Year Costs, Quality of Information - Software Solutions A. Regina has at least two choices in this situation. She can tell the Director of Finance that she cannot produce a very accurate budget within two days or she can pull together something that may not be very accurate. She may believe that her reputation as a diligent employee would suffer if she cannot produce something. However, if she submits a budget based on last year’s budget and she knows that this is likely to be inaccurate, her reputation would also suffer. This is a potential ethical dilemma for Regina because the Director of Finance believes that he can rely on Regina’s work when he presents the budget to the board. If Regina uses last period’s budget, the department amounts and total budget may be quite inaccurate, and the Director of Finance will present the board with information that is unreliable. When the budget is complete the board will likely see it again and notice the discrepancies between the preliminary and actual budgets and wonder why the first budget was so inaccurate, and that could reflect negatively on the Finance Director. More importantly, the board may make inappropriate decisions based on faulty data. B. The board of directors monitors the performance of the CEO and top management. If they have outdated information and inaccurate information, they will draw erroneous conclusions about the performance of the organization and the top management. They may either praise or criticize top management when the situation may not warrant it. They may also use the inaccurate information to help them approve decisions, such as a business expansion. C. Although the board is not directly involved in day-to-day operations, in their role of oversight, they need the most current information available and explanations for information that is not available. The relationship between the CEO and the board should be one of trust and confidence. If Regina submits unrealistically low budgets this month and then more accurate budgets next month, but with large increases in department costs, the board may begin to lose trust in the CEO’s ability to manage operations. Regina should submit the most current information she has, and use last year’s budgets for departments that have not turned theirs in, with a flag indicating that the information quality is low for the budgets in those departments and an explanation that the budget is currently based on last year’s information. Scatter Plots, Cost Function Using Regression, Two Potential Cost Drivers - Brush Prairie High School The data for this problem can be found on the datasets file for chapter 2, available on both the Instructor and Student web sites for the textbook (available at www.wiley.com/canada/eldenburg). A spreadsheet showing the solutions for this problem is available on the Instructor’s web site for the textbook (available at www.wiley.com/canada/eldenburg). A. Other cost drivers for total maintenance cost could be number of rooms cleaned, square feet cleaned, number of hours students attend school, number of hours the building is open, or number of classes and activities per period. Students may have thought of other drivers that could be logically related to cleaning maintenance costs. C. I would eliminate number of students because there does not seem to be a positive linear relationship between maintenance cost and number of students. According to the R Square statistics, changes in maintenance hours worked explains more than 80% of the changes in maintenance cost while number of students explains none. Therefore,maintenance hours isa reasonable cost driver. The p-values on the T-statistics are very small, providing high confidence that both the intercept and slope are different from zero. The total cost function is: TC = $9,135 + $35.75*maintenance hours worked. E. It cannot be known for certain whether the number of maintenance hours is the best cost driver because every single possible cost driver cannot be identified. An unidentified cost driver could have a higher R-Square. However, it is logical to expect a strong relation between hours worked and cost. From the analyses performed, it is rational to conclude that hours worked will provide a reasonable estimate of future costs. ÂŠ 2012 John Wiley and Sons Canada, Ltd. Personal Cost Function, Information System, Two-Point and High-Low Methods A, B, C, and D. The answers to these questions depend on the individual studentâ&#x20AC;&#x2122;s data and cost behavior. E. In some ways, a personal budget estimation problem is similar to the cost estimation problem for a business. Some future costs can be estimated with high accuracy based on prior commitments (e.g., rent). Some costs are discretionary. Other costs are highly uncertain and subject to external factors that cannot be controlled. Cost function Judgment and Methodology A. The cost object is the help line. Accounting records could be accessed to determine the wage rates and time worked for help support staff and supervisors. Analysis of general ledger entries could be used to determine past costs for phone service, supplies, and other miscellaneous costs. If the help line is housed in its own building, depreciation schedules, prepaid insurance schedules, etc. could be used to identify costs for building and occupancy costs. If the service is housed in a common building, cost allocation records could be used to identify past costs. The choice of information sources depends on how the past cost information is to be used. B. Possible cost drivers include number of calls handled, number of hours worked, number of work stations, number of employees, or total number of Internet customers. Information about number of employees and hours worked is found in the payroll accounting system. Number of calls might have to be tracked by employees or by the telephone system. Number of customers is part of the revenue accounting records. Number of work stations might come from the department head. C. It would be useful to obtain several years of monthly data from which to prepare scatter plots and run regression analysis. This data could be found in the accounting system, or it might need to be estimated if it has not been tracked in the past. Vendors, department heads, and others could be interviewed to identify any potential cost increases or other expected changes in cost behavior from prior periods. D. If enough data points are available, regression analysis would probably be the best choice. Regression analysis makes use of all data points and is more accurate than twopoint methods, assuming a linear cost function. If not, a two point method might be best, with representative points selected from a scatter plot. Alternatively, analysis at the account level could be used to develop a cost function using information from the general ledger. * The value in June is used for fixed costs because the increase in salaries will hold into the future. **Using high-low, variable cost is $3.49 ($3,182 - $2,934)/(849 – 778). Use March, high point of daycare supplies cost and children data, to find fixed: $3,182 = F + $3.49*849. ***Using high-low, variable cost is $2.58 ($2,854 - $2,671)/(849 - 778). Use March, high point of daycare other expenses cost and children data, to find fixed: $2.854 = F + $2.58 * 849. Given the preceding computations and cost summary, the cost function is: TC = $19,736 + $6.07*number of children C. At 940 children, July expenses are estimated to be: TC = $19,736 + $6.07*940 = $25,441.80 © 2012 John Wiley and Sons Canada, Ltd. The managers will not know how many children they will service, and costs go up as the number of childrenincrease. The number of children attending is affected by season (vacations), weather, current illnesses that are circulating in the area, and so on. Also, other facilities may open or close, affecting the number of children at this daycare. Prices of all inputs could change (usually increase). E. Answers will vary for students but some sample pros and cons are given: Pros:  Costs tend to appear relatively consistent for the four months data given and therefore they should be representative of a typical months operation results.  The High-Low method is relatively simple and easy to use. Cons:  The High-Low method uses the two extreme points in the data which may lie outside normal activity ranges and therefore may distort the cost function causing the managers to over or underestimate the costs for July.  The estimate does not account for the expected increase in costs for July that typically result from the increased amount of outdoor activities in that month.  This method relies on past results and may not accurately predict or estimate the future costs. F. There is no one answer to this part. Sample solutions and a discussion of typical student responses will be included in assessment guidance on the Instructor’s web site for the textbook (available at www.wiley.com/canada/eldenburg). To predict future overhead, the first month is adjusted even though it is not an actual cost: 4,300/10 x 12 = 35.83/mo. (rounded to $36) 2 Note IB-4's power added to Dept. IP-14 3 Payroll paid every two weeks; 1/2 of August 5 payroll goes to July: 5,500 x 1/2 = 2,750. Similarly, 80% of September 2 payroll to August: .8 x 6,000 = 4,800. No adjustments are needed for items (c) and (d); these are correctly handled. The miscellaneous supplies account also looks suspicious, but there is insufficient information to make an adjustment. B. Operations in the month of July are not typical of the rest of the time period, as shown in the scatter plot below. If these observations are included in the regression analysis, the trend line is likely to distort costs. Because of the large difference between these values and the values in other months, July’s result is an outlier and should be removed from the data. Based on the t-statistic and p-value for the intercept, the fixed cost does not appear to be different from zero. Therefore, the cost function is estimated as: Overhead cost = $6.79 * direct labour hours This cost function might not provide a very accurate estimate for future costs because the direct labour hours explain only about 31% of the variation in overhead costs (based on the adjusted R-square). Thus, considerable future variation in overhead costs is likely to occur due to factors other than changes in direct labour hours. ÂŠ 2012 John Wiley and Sons Canada, Ltd.
D. According to the details provided for August and September, supplies were a large proportion of overhead cost. Based on the variation in dates at which supplies are recorded, they are most likely recorded at the time of purchase rather than at the time of use. Monthly overhead costs for supplies may be significantly overstated or understated if the amount of supplies inventory varies significantly from month to month. Thus, adjustments could be made to adjust the balance in supplies inventory each month. In addition, there could be seasonal variation in costs such as overtime pay and utilities. If the cost function is for annual costs, this may not be a problem, but if the company would like information about predicted monthly costs, these variations would need to be considered. Additional adjustments include any expected changes in costs from prior periods. For example, power costs could be adjusted upward if utility rates in the future are expected to be higher than in the past. 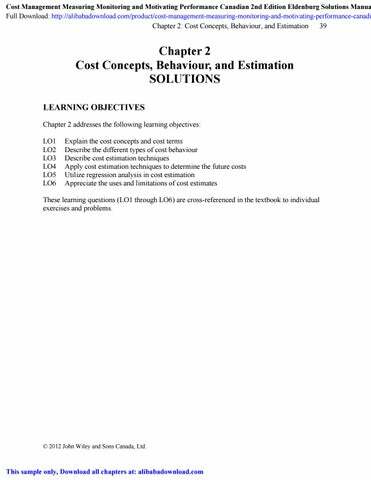 E. Following are three reasons for making adjustments when estimating cost functions. First, the accounting records might not accurately reflect the costs incurred during each time period. The process of preparing financial statements often includes adjustments so that costs are recorded in the correct time period. However, financial statements may be prepared less frequently than data is collected for cost estimation. Second, small adjustments that may be material when estimating a cost might not be sufficiently material to the financial statements for adjustments in the accounting records. Third, sometimes known changes have occurred in prices or cost behavior. Prior cost data should be adjusted for these changes before the data are used to estimate future costs. Coefficients Intercept 133736 X 16.23439 © 2012 John Wiley and Sons Canada, Ltd.
Based on the regression results, the fixed cost and the variable cost per unit for each cost driver are all positive and statistically different from zero. The cost function is estimated as: Labour cost = $107,749 + $16.26 x current month number of chairs produced + $6.54 x prior month number of chairs produced The statistics suggest that this is a more reasonable cost function than the previous version because all coefficients are positive, statistically different from zero, and this regression explains more of the variation in labour costs (86%). E. The first slope coefficient ($16.26) is interpreted in a straight-forward way; each monthâ&#x20AC;&#x2122;s labour costs are expected to increase by $16.l6 for each chair produced during the month. The second slope coefficient requires more thought. As explained in the problem, the company’s policy is to increase the number of workers when production volumes increase, and to decrease the number of workers when production volumes decrease. However, it often takes time for the company to hire qualified new workers, and the managers often delay laying off employees when volumes decline. Thus, there may be some lag between the time that production volumes change and labour costs change. According to the multiple regression results, each month’s labour costs are expected to increase by $6.54 for each chair produced during the prior month. If the prior month’s production was higher than this month’s production, then this month’s labour costs will reflect the higher level of labour cost. Conversely, if the prior month’s production was lower than this month’s production, then this month’s labour costs will reflect a lower level of labour cost. F. There is no one single answer to this question. On one hand, it appears that both independent variables should be included in the cost function because they both have a logical cause-and-effect relationship with labour costs, and they both have positive and statistically significant coefficients. In addition, the two cost drivers together explain a very high proportion (86%) of the variation in past labour costs. On the other hand, it could be argued that some other cost driver might do a better job of predicting future labour costs.